Here are 5 free websites to extract pages from PDF online. After uploading PDF from your PC, you can select pages that you want to extract and then get the output as separate PDF files that will contain only the selected pages. Some of these PDF page extractor websites also come with a feature to create one single PDF for all the selected pages. A few other interesting features are also present that you can try. For example, you can save extracted pages from PDF to Google Drive or Dropbox, upload online PDF using its URL, zoom in thumbnails of PDF pages to view each page properly, etc. Let’s check these websites to extract pages from PDF. Smallpdf.com is perhaps the best option to extract pages from PDF. Its Split PDF tool is simply awesome. The reason is it uploaded a PDF file around 493 MB easily and I was able to quickly select pages that I wanted to extract as a separate PDF file. A thumbnail for each page is visible that helps you select the correct page for extraction. You have the choice to extract pages as separate PDF files generate a single PDF for all the selected pages. It gives drag n drop feature or you can manually upload PDF from PC. After that, you can extract pages from PDF in just two steps. Once the output is in front of you, it gives three options to save it: download it to PC, Google Drive, and Dropbox. The free plan lets you process 2 tasks per hour but I think it is good for normal use. If you don’t like the free plan, then you can also think about Pro plan. Or else, continue using the free plan. PDF.io is another fantastic website to extract pages from PDF. Like Smallpdf.com, I wasn’t able to find out the PDF size limit but it uploaded the same 493 MB PDF file successfully from PC that I used while testing Smallpdf.com. You can also use it add PDF from Google Dropbox, or add URL of an online PDF. 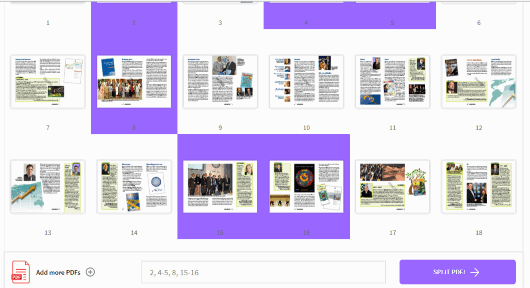 When the PDF is added, thumbnails of PDF pages are visible one after another. Selecting the PDF pages for extraction is pretty easy. You can either enter custom page range, or select pages by clicking on their thumbnails. Once the pages are selected, you can also select option to generate output as separate PDFs. Or else, keep that option unchecked if you want to create a single PDF. Use SPLIT button, wait for the extraction process, and then you can save output PDF(s) to PC, Dropbox, or Google Drive. Online2PDF.com has a very good PDF page extractor tool that I like very much. There are three great features that catch the attention. You can add multiple PDF files (up to 20) and then set separate page range for each PDF to extract pages. Also, you can either create a single PDF for the selected page range, create separate PDF files for selected pages, or generate a single PDF for each page of different PDF files. The free is limited to upload maximum 100 MB PDF file or 150 MB PDF files in total but I think this limit is sufficient. So, add PDF file(s), use options and generate the output PDF from the selected pages. Apart from that, it also lets you add header and footer to PDF pages and set password protection for output PDFs. All its features are fantastic. Therefore, this website is a better option to extract pages from PDF. Ilovepdf.com also has a separate PDF page extractor tool that competes quite well with other websites. Its PDF page extractor lets you set page range and individual pages or you can create different PDF files for each page of input PDF. It doesn’t let you view thumbnails of PDF pages but adding page range to extract pages from PDF is pretty simple. You can add PDF from Dropbox, Google Drive, or PC and then save the extracted pages in any of these supported platforms. This website is very useful but like many other similar sites, its free plan to extract PDF pages is limited. In the free sign up plan, you can set 12 page range to extract pages and upload maximum 100 MB PDF file. I guess this plan is sufficient for normal use. Therefore, it is a good website to try. Sejda.com also brings a useful tool to extract PDF pages. It also gives multiple ways to upload PDF file, which are: PC, online PDF, Google Drive and Dropbox. 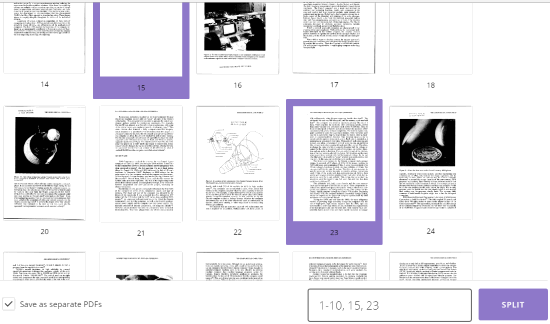 Another good feature of this website is once the PDF is uploaded, you can see thumbnails of all those pages and also zoom in all thumbnails to view each page properly. After that, you need to select pages for extraction. Once the pages are selected, you will get the output in a few seconds. You have the options to download extracted pages as a single PDF to your PC, Google Drive, and Dropbox accounts. In its free plan, a PDF with 50 MB size or 200 pages can be uploaded. Also, you can perform 3 tasks per minute. If that fits your requirements, this is a nice option. Extracting pages from PDF online is done by all these websites pretty well. But, as you can see, first two are the most useful websites here. So, I will suggest you first try these two websites to extract pages from PDF. If these two websites don’t work for you, then you may also check other websites.